Eagle Hardware Farm & Ranch offers the best fence supplies and tools for your needs. We offer fence supplies and tools for electrical fencing, steel posts, chain link, field fence, and cattle/hog panels to hold and protect any type of livestock. 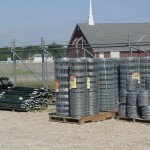 We also stock pipe for all your fencing and ranch projects. Some of our brands include Stay-Tuff, Behlen, OKC Steel and TXI Concrete. NEW at Eagle! Patriot solar fence chargers. We stock the P50 and P155 solar fence charger and the P10 electric fence charger. For more information click here. OK Steel no climb wire fencing is the Feb. 8 Featured Item of the Week. February Featured Items of the Week include Fix a Flat, fencing wire, ammunition, and Lindners Feed. Ready Seal is our May 18 Featured Item of the Week. Fencing Need a Repair or Redo? Spring is a great season to do the needed fencing repair or redo on your property. 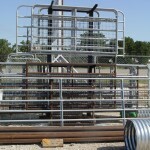 Eagle Hardware offers Oklahoma Steel Max 50 cattle panels.